The Berlin Tegel airport is crowded as always. Passengers are waiting to board a flight to Tel Aviv. Assaf Kacholi, who found a home both in Berlin and Tel Aviv is listening to music to pass the time. Assaf has a passion for exploring new music. “I really listen to everything – from all over the world – and I’m always gathering ideas. I can’t listen to music without thinking: I would love to sing that sometime.“ A few minutes later he boards the plane, already absorbed by the sound of a new discovery. His fascination for the German language grew while he was studying Schubert and Schumann Lieder at the Rubin Music Academy in Tel Aviv. Consequently, he decided to move to Berlin in 2002, to pursue further musical training and expand his vocal artistry. 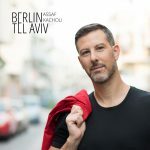 During his stay in Berlin Assaf never lost his connection to his Israeli home, and so the Tel Aviv-Berlin route became part of his regular life. Berlin has an art scene that is, on one hand, influenced by a strong German classical music culture and, on the other, strives to create something new and wild. Tel Aviv is the culture of Assaf’s origins, a combination of a modern metropolis and traditional, centuries-old Jewish music. Assaf’s collection includes songs from the classical European canon, vocal music by Baroque composer John Dowland and romantic songs, such as the title song from Franco Zeffirelli’s film Romeo and Juliette, as well as songs with a Jewish cultural background (e.g., the Biblical “Song of Songs“, Sasha Argov’s “Lullaby“). There are also songs by the Jewish-American composer George Gershwin and Kurt Weill who emigrated to the United Sates from Berlin. Assaf deliberately chose not to produce a downloadable playlist. “It is very important to me that people can hold the CD in their hands.“ The order of the songs is supposed to create an overall connection. “I like to listen to a CD from beginning to end.“ The sequence itself describes Assaf’s search for his personal and cultural heritage and artistic inspiration. Assaf lands in Tel Aviv. He has made new discoveries and collected ideas for a new project. He smiles with a twinkle in his eye, the Israeli “sunnyboy“, as some of his friends like to call him. Once again he has arrived at one of his homes.